When I think of Iceland I think of a frozen, snow white county in the Northern Hemisphere. The Perlan (the Pearl) is a landmark in Reykjavik, Iceland. Reykjavik is the first permanent settlement in Iceland and was established around 870. The city itself was founded in 1786 and was a trading town and grew quickly over the next decades. It transformed from a region into a regional and then later a national center of commerce, population and governmental activates. Reykjavik is the capital of this cold country. 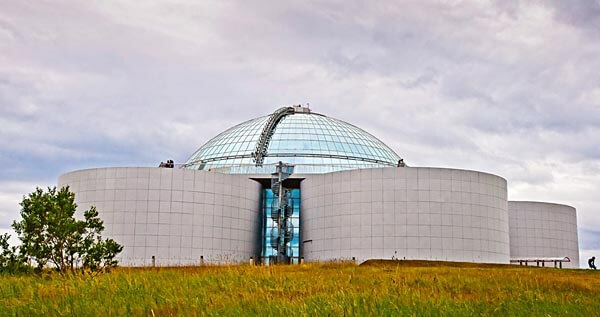 Perlan is situated on the top of the hill Oskjulio and considered one of the main attractions in the city... It is here, Perlan, a glass dome resting on five hot water tanks calls home. Perlan has 10,000 cubic meter of space for exhibitions on its ground floor which is called the Winter Garden. Here many concerts are held by local Iceland artists such as Gus Gus and Emiliana Torini. It also holds expos and markets. One of the water tanks has been drained and is now the Saga Museum which tells you about the Icelandic sagas in history. Head up to the fourth floor observation deck which contains panoramic telescopes at each of its six corners. It has recorded descriptions of what you are seeing in five languages. Here on the fourth floor you will find three shops. The Gourmet shop where you can buy foodstuffs, including oysters, langoustine, mushrooms, world jams, beef fillets wild game and smoked salmon. The Souvenir Shop has t-shirts, postcards, Viking helmet, warm woolen sweaters and Icelandic art. You can even get a post card or two to send home from here. Within the Gourmet shop you will find an All Year Christmas Shop that sells Christmas items related to Iceland such as Icelandic Julelad and other decoration that is handcrafted. The fourth floor also has a cafeteria in the gourmet shop. Now head up to the fifth floor of the Perlan and have dinner in the revolving restaurant. So button up your over coat, put on your hat, scarf and gloves and spend some time in Iceland. Last updated by jack on 28 February, 2012 in Destinations.